Features include a Letter from the President, Introduction of the new KDA Administrative Coordinator, The Neigh with special guest Kimberly Phillips and a clinic report from Madelyn Taray of her ride in the George Williams Clinic hosted by KDA in April. 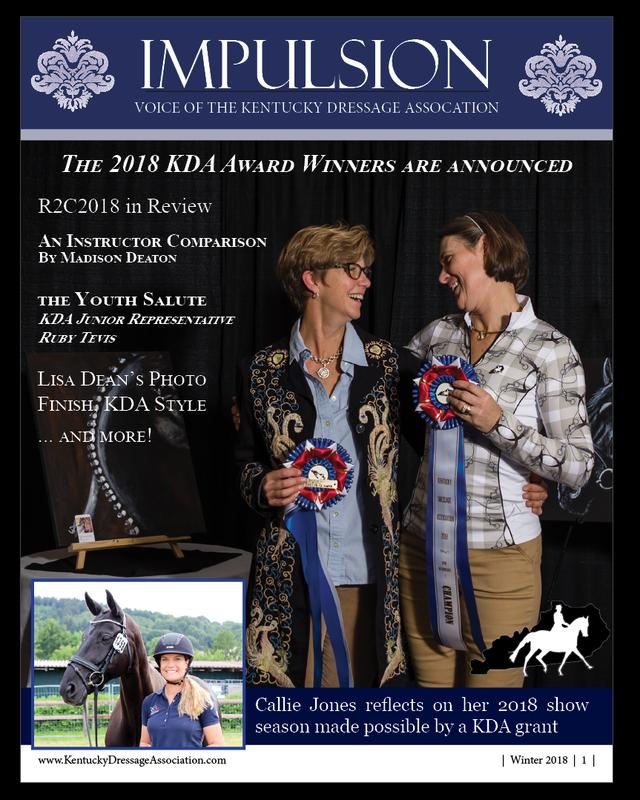 Features include The Neigh with special guest Maureen Sullivan, clinic reports for the Charlotte Dujardin World Class held at The Kentucky Horse Park and information about the KDA sponsored volunteer clinic. Special Feature: New Organization, Old Discipline How the Western Dressage Organization Came To Be by Katherine Rosback. First in a three-part series on the beginnings, the rules, the tests, and the future of Western Dressage. Features include a fare well letter from the Past President of the KDA-Cindy Smith, Michelle Morehead's review of the USDF Convention, a behind the scenes look at safety at the KDA shows, The Neigh with Karen Taylor, calendars and info for the need to know!